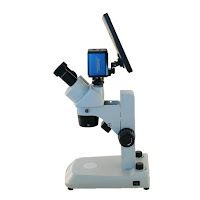 The museum demonstration high definition display microscope was designed for use in museum and art exhibits. The stereo microscope provides dual magnification of 10x and 30x, ideal for viewing archeological samples, botany samples, fossils and insects. 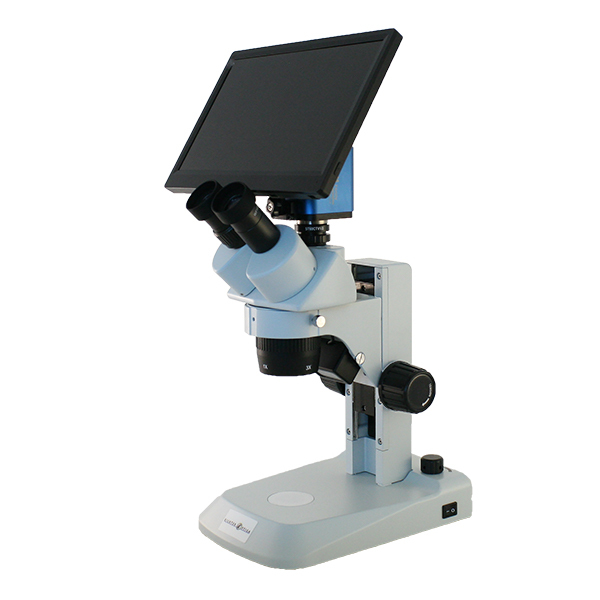 The microscope is equipped with a high definition HD camera and a 12" HD monitor. The high definition monitor can face any direction, providing some options for exhibit setup. If the monitor is facing away from the eyepieces the microscope can be set up allowing visitors to look through the eyepieces on one side of the exhibit, while on the other side guests can gather around the monitor and view the samples. Alternatively, the museum microscope could be set up in an area where visitors don't have the ability to touch the microscope, but are still able to view the samples underneath the microscope. The display microscope has top and bottom LED illumination. This light is a cool light and will not heat up or harm any living specimens. Each light has its own rheostat intensity control. Purchase the museum display microscope here.